Again, I found this one at a thrift store. Was 30 dollars. I'm surprised... I expected something to be wrong with it, but nope. I literally picked up a 200 - 300 dollar ultrawide monitor at a thrift store for 30 bucks. What a beautiful monitor. And with the new wave of monitors coming out, you can probably snag one for cheap. 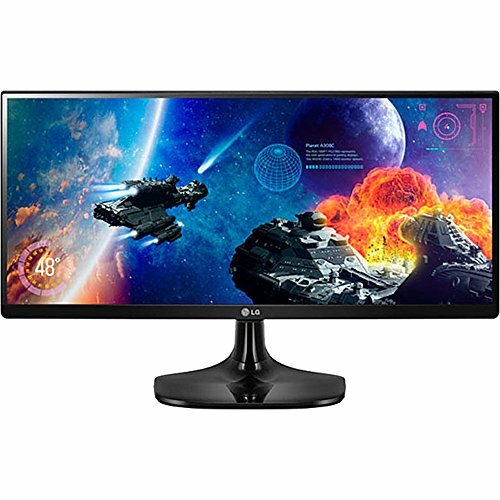 A good price for an ultra-wide monitor. Complaints about the contrast are fair, but one of the presets (fps 2) covers the whole visible contrast spectrum. A bit limited by the scarcity of content for 21:9 aspect ratios, but a good choice for games that can support it. I love and hate this monitor at the same time. Its great because its super wide but sometimes it makes me feel like its a small screen. Its definitely smaller than a normal 25 inch monitor but definitely wider. You will have to get used to the small size of the screen before you will like it. Enjoying this gaming monitor. I'm never going back to standard aspect ratio again. UltraWide is very immersive. It's got good gaming tweaks and though it's only 60hz, it's enough for me. It's cheap, and I wasn't about to shell out the money for the 34 inch curved LG UltraWide. Can't adjust the height, but a nice desk monitor riser works well. Got this thing on sale for $130 instead of $180. Man, was that worth it. It's a very nice 1080p panel. Colors are excellent, the built-in software is easy to use, and the one button under it. Yeah, that's a thing. Problem is, it's a bit short, so if you're used to anything larger than a 21.5in panel, you might need to adjust to the height of this thing. Otherwise, it's an outstanding panel for what I paid.